The club needs your help in all sorts of ways. From volunteering at fundraising events and at our own time trials and galas to helping run the club committee or becoming a swimming official. Fundraising is an important element of being part of the club. The monthly fees don’t cover all the running costs, mainly swimming pool charges. To keep our fees low we depend on income from other sources. See the fundraising page for the regular events and look out for emails asking for your help. Entry desk – taking payment for entry, programs, raffle tickets etc. Marshalling – organising the kids into heats/lane order at the right time. Posting of times – basically taking print outs of results and sticking them on walls for kids & parents to view. General help – handing out water, sweets, lunch tickets etc. 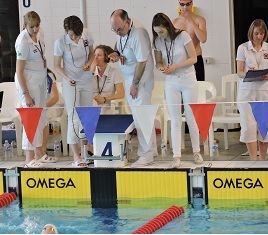 The club must provide a quota of technical officials for any meet where we have swimmers competing. For a meet to be accredited and the times to count there are a minimum number of officials required. As a club we want to ensure that the swimmers times are valid so encourage as many parents as possible to get involved. All training starts with timekeeping, and progresses in the order below. Timekeepers must be at least 14 years old, so is suitable for senior swimmers as well as parents. You can stop at any level you like, there is no expectation that everyone will progress through the levels. Competition days are normally split into morning and afternoon sessions, you can sign up to help at one or both. You’ll get a much better view of your child from the poolside than the spectators gallery, and it’s usually cooler! For further information and to find out if any courses are planned please email secretary@swimhearts.com. Timekeeper – there will be at least one timekeeper on each lane even when electronic timing is used. The club runs regular timekeeper training sessions which only takes 2 hours. After that you can officiate on poolside. Judge 1 – this course teaches you the rules of each stroke and trains you to be a turn judge, positioned at the start and turn ends of the pool. You will be mentored for a number of sessions before a final poolside assessment. Judge 2 – this qualifies you to judge the stroke during the race and also how to report the finish order. The stroke judge is positioned at each side of the pool. Referee – you will be eligible to start Referee training once you are a certificated Starter and have 12 months experience in this role. Training takes almost 1 year and at the end there is a written examination and a final assessment before you are certificated as a Referee. Your qualifications achieved will allow you to officiate at events throughout Scotland, England and Wales as the courses are the same in all of the home countries. There is further detail and information on courses for each level on the East District website.